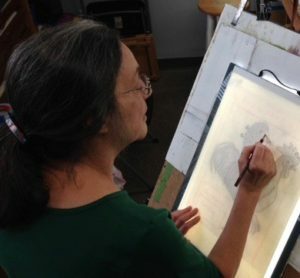 My name is Caroline Trippe, and I am a self-taught draftsman and painter. Since 2007 I have been writing and illustrating my own versions of the myths and fairy tales that enchanted me as a child. These story-and-picture books have become my preferred means of artistic expression, and I have worked on them exclusively for the last several years. Over time, the power of the old stories has deepened for me––it is their human content that anchors them so firmly in my heart and mind. I delight in re-telling and interpreting the tales in my own idiom. I very much like working in a series, and find that the narratives generate and give impetus to the flow of the illustrations. Each series, including the writing, takes between one and two years to complete. I choose stories that suit my particular sensibilities and abilities, and although I love such well-known tales as “Snow White” and “Sleeping Beauty,” I prefer, for the most part, to take on lesser known stories for my own variants, hoping to avoid too much conscious or unconscious influence. The re-tooled stories in The Rapunzel Room and Apple Mother are the most experimental, and do include riffs on some of the best known fairy tales of the Brothers Grimm. Illustration has presented me with new and exciting challenges. It has made me a keener observer, engaging me more deeply with the world around me. My models are ordinary people, and I often borrow everyday objects and elements of local landscapes to fabricate imaginary worlds and characters. Are these children’s books? Yes and no. They are meant to appeal as much to adults of any age who love the genre as they are to children of any age. I think of them as books for keeping-–my way of sharing my artwork with others. Site & Contents © Caroline Trippe, 2011 forward.